What is an air admittance valve (AAV) or Studor Vent® and how are they used? Air admittance valves or Studor Vents (a trade name for a specific air admittance valve brand) are often found where it is difficult or even impossible to install conventional plumbing vent piping; in other installations air admittance valves may supplement the building's existing vent piping system to avoid trip siphonage and dangerous methane gas leaks during periods of heavy water usage. This article series defines plumbing vent system terms, distances, and functions, and other specifications and code requirements. We explain how plumbing vents work on buildings, why plumbing vent piping is needed, and what happens to the building drains when the vent piping is not working. Definition of Air Admittance Valve (AAV): An AAV is a one-way valve that allows air to enter the drain to satisfy the vacuum caused by water passing down the drainage system, but that prevents sewer gases from backing up through the vent into the building. Above, a Studor® Redi-Vent Air Admittance Valve from IPC Corporation. Here we define Air Admittance Valves (AAVs) and explain where and how they are used. Question: what are those one-way vents called - used under sinks in cabinets? What are the one way vents called under sinks in cabinets? Reply: air admittance valves or AAVs, or "Studor Vent"
Vacuum breaker vents or "cheater vents" or "studor vetns" or more formally and properly, "air admittance valves" (AAVs) for which an example is the V-200 Jon. That's what you are asking about. Other examples of air admittance valves (AAV s) or inline vents include models produced Keeney Mfg. 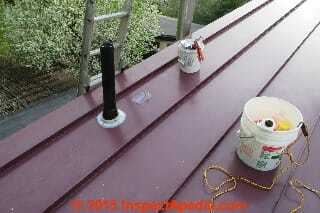 Vanity Installation Kit, and the Oatey 20 DFU Sure-Vent (Oatey 39016 or 39017 and other models). Most of the AAV manufacturers offer a range of AAV models. The Oatey SUre-Vent 39016 includes ANSI ASSE certifications stamped right on the valve top. Above: a conventional plumbing vent stack termination above the roof line. If a plumbing drain is not vented to the atmosphere drain performance is likely be slow and noisy. Worse, the vacuum created by water passing through the drain waste piping system can cause water to be siphoned out of plumbing fixtrure traps. The loss of that trap water will in turn permit potentially explosive sewer gases to enter the building. Typical "standard" plumbing systems include a plumbing vent pipe that passes up through the building roof and terminates above it. When a sink, toilet, shower or tub or similar plumbing fixture empties into its drain system in a standard plumbing arrangement, the vacuum that would be caused by water running down the drain pipe is relieved by air that enters the piping system through the plumbing vent stack. If we did not relieve that vaccum pressure in the drain line the drain would pass wastewater poorly, slowly, and often with a bubbling or glub glub noise. 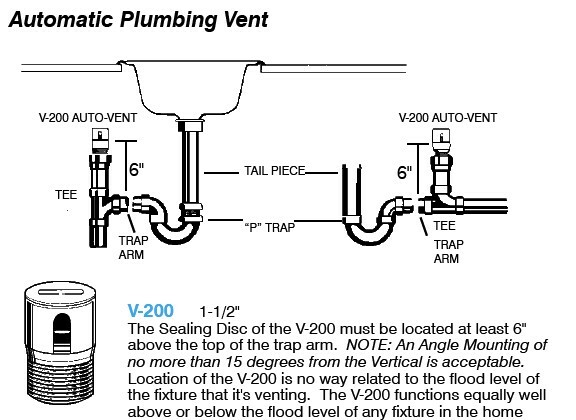 At PLUMBING VENT NOISE we also describe Air admittance valves, studor vents, vacuum breaker valves, in-line vents, or the V-200: these products are used in both new construction (where permitted by the local plumbing inspector) and as a retrofit where a building plumbing fixture is having drain problems such as trap siphonage because the fixture is not vented or not adequately vented. Sewer gases that enter the waste piping system are blocked from passing out through a sink, shower or tub drain by water in the "U" portion of the drain trap, typically a "P-trap". Sewer gases are blocked from passing out through the toilet base by water in the toilet. Plumbing guidelines and rules define the allowable distance between any plumbing fixture and the plumbing vent stack; if a fixture is located too far from the vent, its drainage may be poor and there is risk of plumbing trap siphonage and dangerous sewer gas release in the building. Where a conventional plumbing vent system is not available or not feasible the local plumbing inspector may permit an air admittance valve to be installed. 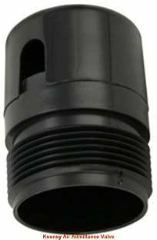 An air admittance valve is designed to allow air in to the drain piping system to which it is connected whenever pressure in the drain system is below atmospheric pressure outside the valve. Air admittance valve (AAV) lets air in at the valve opening: the vacuum created by water passing down the drain system opens a valve in the AAV to permit air to enter the drain system, thus satisfying or relieving the vacuum, both to improve drainage and avoid drain noises. The AAV closes when there is no vacuum in the drain system - that is when wastewater is not passing down the drain, preventing sewer gases from passing back up the drain system and out through the AAV. 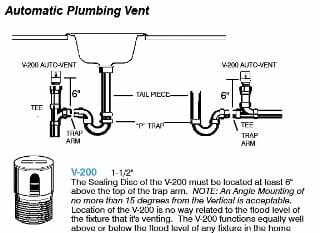 Air admittance valves are located close to the fixture they serve, and are placed above the drain line as well as 6" above the P-trap weir as shown in the V-200 AAV installation instructions illustrated below. Some plumbing literature describes AAVs as P.A.P.A. devices. And some suppliers (National Builders Supply) recommend locating AAVs or PAPA devices throughout the plumbing system to improve drain performance by handling variations in air pressure in the drain-waste-vent system (DWV system), and to avoid trap siphonage. also see ODORS GASES SMELLS, DIAGNOSIS & CURE. 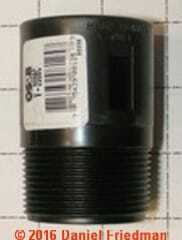 Air Admittance Valves retail for prices between about $6.00 and $32.00 U.S.D. Below is a mechanical air admittance vent from Keeney and retailing about $6. You'll note that it looks a bit like the V-200 shown above. Air admittance valves (AAVs) or if you're using the "Kleenex" form of the term, Studor Vents are sold in various sizes or venting capacities. Air admittance valve capacity is the measure of the volume of wastewater and its flow rate that the valve can handle while preventing trap siphonage and methane gas hazards. If building wastewater flows exceed the rating of the AAV then it is inadequate and the building may be unsafe as water may siphon from traps and explosive methane gas could enter the building. AAV manufacturers such as Studor® typically describe air admittance valve sizing or AAVs used in a combination of installation points to match building size: a rough estimate of the actual drain flow. Oatey rates their AAVs in DFUs and provide four AAVS at sizes of 5, 20, 160 and 500 DFUs while some other manufacturers such as Studor describe products in flow rates of wastewater in liters per second. See PLUMBING DRAIN FIXTURE UNITS DFUs for an explanation of plumbing vent Drain Fixture Units or DFUs, and for an explanation of how DFUs are calculated and used in sizing drain waste vent piping including the selection of a proper air admittance valve or AAV sizing. Oatey's Sure-Vent intended for 1 1/2 to 2" drain piping is described (at Home Depot) as in compliance with ASSE Stdandards 1050 and 1051, for use as a secondary vent, rated to handle up to a 3" drain pipe. 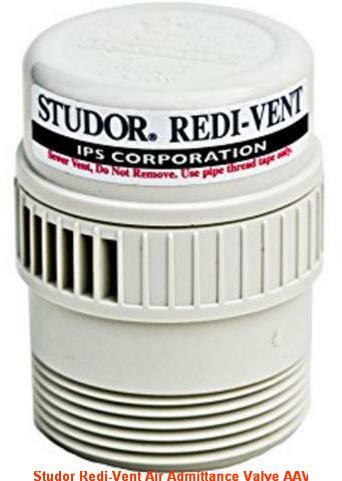 Studor's Mini-Vent™ - 7.5 liters/second at 250 pa (10 pa = 1 mm water gauge). This vent can handle up to 160 DFUs on a single plumbing vent branch or up to 24 DFUs on a plumbing vent stack. Studor's Mini-Vent™ is used for fenting a single plumbing fixture or a small group of plumbing fixtures such as in a residential kitchen or bath. A residential kitchen sink drain also serving a dishwasher should be fine with the smallest AAV size. Studor®'s Maxi-Vent™ is a high capacity air admittance valve that protects trap seals throughout the drainage system of larger buildings. Used alone and installed as the manufacturer directs, the Maxi-Vent™ can handle plumbing drain venting requirements for a typical low rise residential building of three or four floors in height. In high rise buildings taller than 10 floors, Studor provides a Studor System venting design of highest capacity. The purpose of an air admittance valve is to provide a method of allowing air to enter the plumbing system without the use of a vent extended to open air and to prevent sewer gases from escaping inside a building. 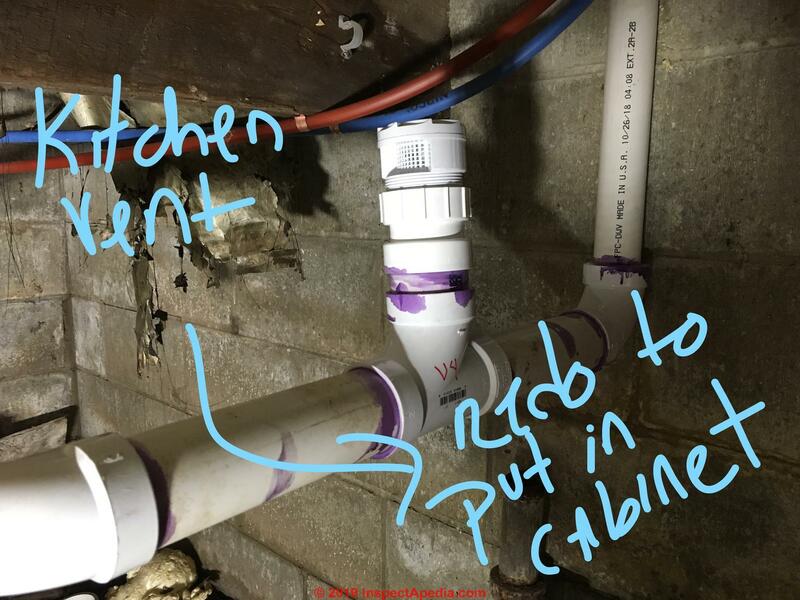 The photo of an inline plumbing vent or air admittance valve shown here, contributed by reader Megan, was posted originally at PLUMBING VENT CODES & DEFINITIONS. This vent, installed in a basement or crawl space, was not properly-located according to Megan's plumbing inspector. 917.1 General. Vent systems utilizing air admittance valves shall comply with this section. Stack-type air admittance valves shall conform to ASSE 1050. Individual and branch-type air admittance valves shall conform to ASSE 1051. 917.2 Installation. The valves shall be installed in accordance with the requirements of this section and the manufacturer’s installation instructions. Air admittance valves shall be installed after the DWV testing required by Section 312.2 or 312.3 has been performed. 917.3 Where permitted. Individual, branch and circuit vents shall be permitted to terminate with a connection to an individual or branch-type air admittance valve. Stack vents and vent stacks shall be permitted to terminate to stack-type air admittance valves. Individual and branch-type air admittance valves shall vent only fixtures that are on the same floor level and connect to a horizontal branch drain. The horizontal branch drain having individual and branch-type air admittance valves shall conform to Section 917.3.1 or 917.3.2. Stack-type air admittance valves shall conform to Section 917.3.3. 917.3.1 Location of branch. The horizontal branch drain shall connect to the drainage stack or building drain a maximum of four branch intervals from the top of the stack. The relief vent shall connect to the horizontal branch drain between the stack and the most downstream fixture drain connected to the horizontal branch drain. The relief vent shall be sized in accordance with Section 916.2 and installed in accordance with Section 905. The relief vent shall be permitted to serve as the vent for other fixtures. 917.4 Location. Individual and branch-type air admittance valves shall be located a minimum of 4 inches (102 mm) above the horizontal branch drain or fixture drain being vented. Stack-type air admittance valves shall be located not less than 6 inches (152 mm) above the flood level rim of the highest fixture being vented. The air admittance valve shall be located within the maximum developed length permitted for the vent. The air admittance valve shall be installed a minimum of 6 inches (152 mm) above insulation materials. 917.5 Access and ventilation. Access shall be provided to all air admittance valves. The valve shall be located within a ventilated space that allows air to enter the valve. 917.6 Size. The air admittance valve shall be rated in accordance with the standard for the size of the vent to which the valve is connected. 917.7 Vent required. Within each plumbing system, a minimumof one stack vent or vent stack shall extend outdoors to the open air. 917.8 Prohibited installations. Air admittance valves shall not be installed in nonneutralized special waste systems as described in Chapter 8. Valves shall not be located in spaces utilized as supply or return air plenums. 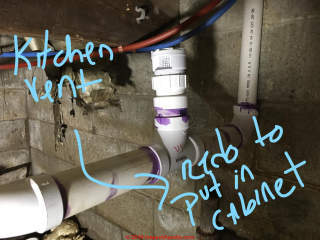 DISTANCE: vent piping be located from a plumbing fixture? AIR ADMITTANCE VALVES AAVs at InspectApedia.com - online encyclopedia of building & environmental inspection, testing, diagnosis, repair, & problem prevention advice.